Redin is helping prospective homeowners understand the risks associated with a high-cost home in certain cities. A new study from the tech-focused brokerage maps how disaster-prone certain metros are, while also factoring the cost of buying a home in that city. The study found that metros with low disaster scores tend to be more affordable places to live, with nine out of the 10 least-hazardous cities having median home prices below the $287,400 national median. Detroit, Indianapolis and Buffalo are among the least disaster-prone and most affordable places to live. Fairweather explained that even during times of calm, homeowners still have to pay costly insurance premiums in these already expensive housing markets. “Some homes in more hazardous areas might seem more affordable if you are just looking at the sticker price, but they may end up costing more when risks related to natural disasters are factored in,” Fairweather added. 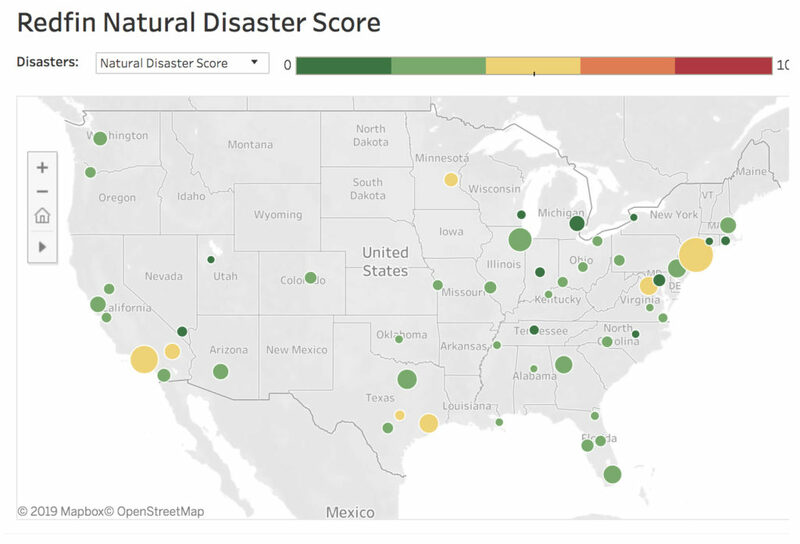 Washington, D.C. and Los Angeles were reported to be the most disaster-prone, both of which have a median home value above the national average. In Los Angeles, there’s a high risk of both earthquakes and fires. In Washington D.C., hurricanes and flooding make the city more disaster-prone. To determine which areas were the most disaster-prone, Redfin broke the score down into five categories: earthquakes, fires, floods, tornadoes and hurricanes. The research team used disaster declaration summaries for each metro, provided by the Federal Emergency Management Agency (FEMA) from 1953 to present. See the full list and interactive map here.